The Invasion of Russia (1812). First entry in a new series of games covering the Campaigns of the Napoleonic Wars at low to moderate level of complexity. 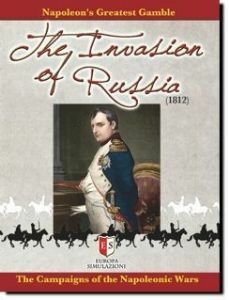 At the heart of The Invasion of Russia (1812) are innovative and simple mechanics intended to encapsulate key elements of campaign warfare during the Napoleonic period; sweeping manoeuvres, feints and deceptions, forced marches, the greater flexibility and cohesion of seasoned troops, and the crucial importance of logistics. This is a very playable game with two sheets of large die-cut counters, one map of Russia and bordering states, at a scale of about 33 miles per hex, 15 days per game-turn. Each unit counter roughly represents a division. The Invasion of Russia (1812) is very much a wargame, with an emphasis is upon the challenges of leading and co-ordinating armies during the Napoleonic period. Victory will generally go to the player who is best able to formulate and implement a cogent strategy aimed at attaining well defined objectives, whilst allowing a margin of error for enemy action and ill-fortune.